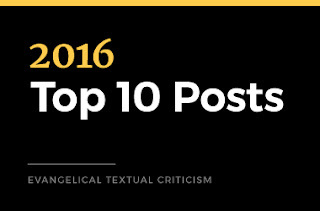 These are the top ten most read posts for the blog in 2016 according to Google Analytics. Not all of these were written in 2016 of course. For last year’s list, see here. 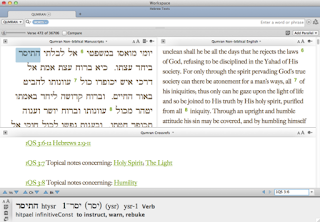 How Many Variants Make It into Your Greek New Testament? I’ve been busy lately with a cross-Atlantic move. So here are some things I’ve come across the last month or so but haven’t been able to blog about. Let me know if I missed anything. 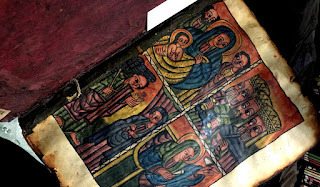 For more from Elijah on the Codex Rossanensis, see here. Read this for a sneak peek at Pete’s forthcoming monograph on P47. 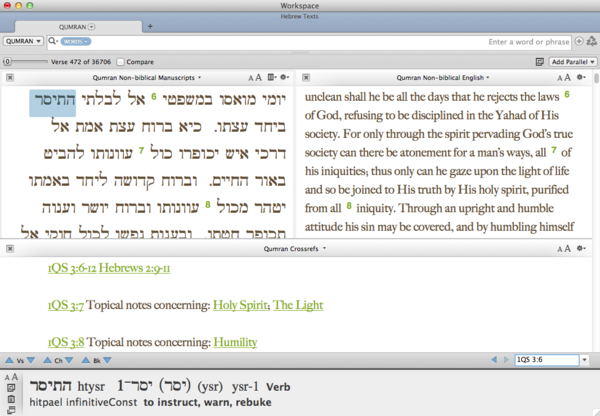 In this article he samples his work on scribal habits and scribal re-inking. The keyword here is simple. This is some of the first fruits of my own dissertation. DSH has a special section on “Social Digital Scholarly Editing” edited by Barbara Bordalejo and Peter Robinson. It includes essays by Paul Eggert and Peter Shillingsburg. But I haven’t had time to read any of them yet. 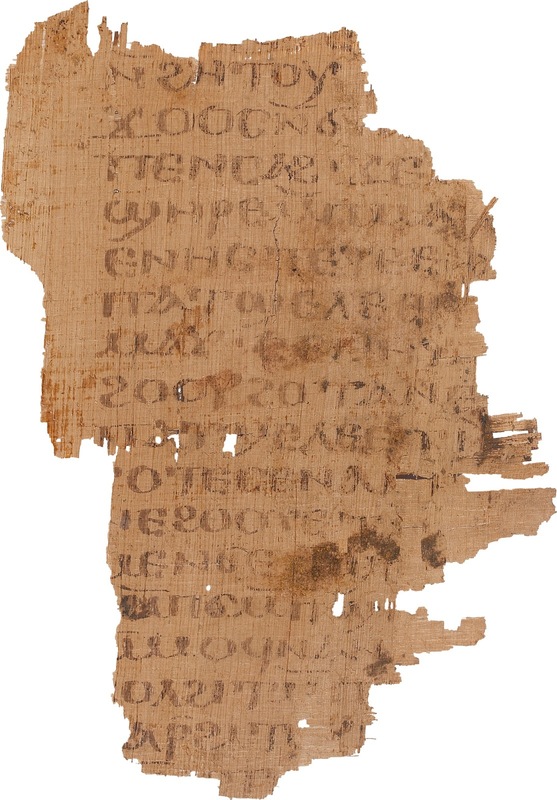 “At the SBL Annual Meeting in San Antonio last month, the Deputy Director of ITSEE, Dr Hugh Houghton, was elected as Executive Editor of the International Greek New Testament Project (IGNTP), with responsibility for the Pauline Epistles.... The position is open-ended, and involves overseeing the preparation of editions of the Greek text of the Pauline Epistles which are expected to appear in the Novum Testamentum Graecum Editio Critica Maior (ECM), published by the German Bible Society.” If you missed, it we interviewed Hugh on the blog: part 1 and part 2. 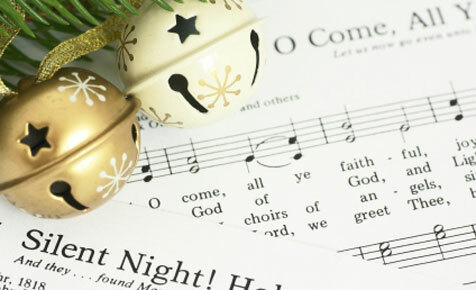 Can anyone cite instances where unusual variant readings have affected Christmas carols? 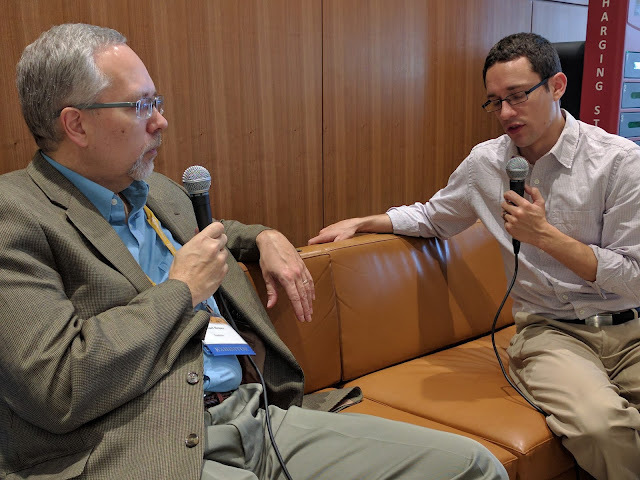 One of the fun things I did while at SBL was sit down with Michael Heiser for an interview on his “Naked Bible podcast.” We talked about what makes the ETC blog Evangelical, about CSNTM, the CBGM, and whether the KJV is the best Bible ever. It was good fun and I managed to make only one outrageously inaccurate statement. Thankfully I caught it before too long. You all can tell me if there are others. Also, don’t miss his interview with Thomas Hudgins on his recently finished PhD thesis on the Complutensian Polyglot (more here). 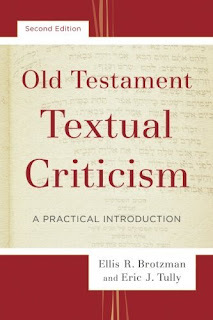 As an introduction to textual criticism, this volume has heuristic value in that it orients the reader to the discourse and practice of textual criticism. As an introduction to textual criticism, the volume is not as helpful as it could have been. The discussion on the text history of the Old Testament is not current. The information on the Greek versions was incomplete and mistaken in places. The volume appeared to follow other chief works in the field such as Tov’s and as a result it lacked fresh analysis and presentation of the immensely important subject matter. 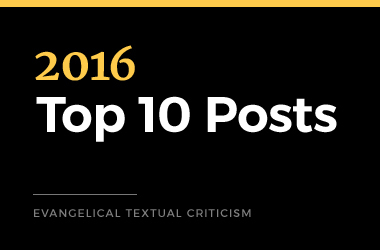 The field of textual criticism is already challenging enough to the novice, but when there are mistakes and discussions are presented in an incomplete and stale manner, the authors make it harder for the student to learn this skill than necessary. Brotzman’s new co-author, Eric Tully, thinks John missed the aim of the book as an introduction and gives a lengthy response as a result. I will say that writing an introduction is tough. It requires a real mastery of the field in question but also a good sense of what students need and how they will be able to digest it. Moreover, it needs to introduce students both to the history of the discipline but also to the current “state of play.” For a long time, my personal favorite in this genre has been Jobes’ and Silva’s introduction to the Septuagint. It’s a great model in this. I haven’t seen the 2nd edition yet but I understand it keeps the same basic structure of the original edition. As an addendum, I think we can all agree that John Meade needs to blog more for us here at ETC. Besides benefiting all of us with his OTTC expertise, it would make up for the fact that he roots for the Denver Broncos. At SBL I enjoyed the session discussing Peter Lampe’s book, From Paul to Valentinus: Christians at Rome in the First Two Centuries (Fortress Press, 2003) (S19-340: Polis and Ekklesia: Investigations of Urban Christianity). This included interesting presentations from John Kloppenborg, Jutta Dresken-Weiland, and Mark Reasoner (Peter Lampe himself was not present, which was fair enough considering his recent heart surgery involving a triple bypass). 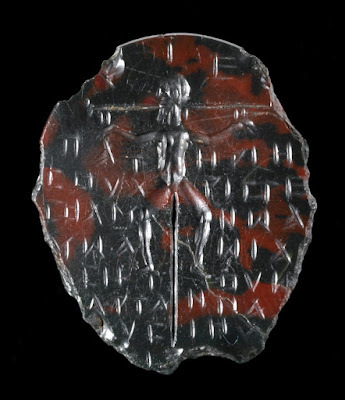 Jutta Dresken-Weiland talked about new archaeological finds or acquisitions from the late second or early third century which were not known to Lampe, but which provide important early evidence for Christian presence in and around Rome. (I suspect a fair bit of this might be in her book: Bild, Wort, und Grab. Untersuchungen zu Jenseitsvorstellungen von Christen des 3.–6. Jahrhunderts (Regensburg 2010), but I haven’t seen this book). 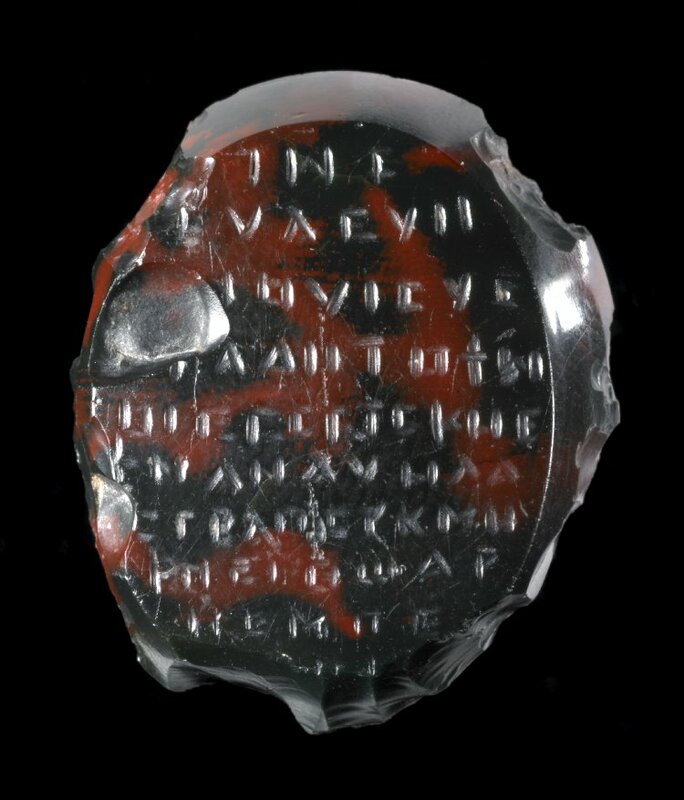 One interesting piece she talked about was a gemstone in the British Museum in London (1986,0501.1). This has a pictorial representation of the crucifixion of Jesus Christ, probably the earliest extant representation. She offered a date of c. AD 200. P. Derchain, ‘Die älteste Darstellung des Gekreuzigten auf einer magischen Gemme des 3. (?) Jahrhunderts’ Christentum am Nil. Internationale Arbeitstagung zur Ausstellung “Koptische Kunst”. Essen, Villa Hügel, 23.-25. Juli 1963 (ed. Κ. Wessel; Recklinghausen: A. Bongers, 1964), 109-113. For further information see the British Museum website, Simone Michel, Die Magischen Gemmen im Britischen Museum (London: BMP, 2001), No. 457 (pp. 283-284) text here; Jeffrey Spier, Late Antique and Early Christian Gems (Wiesbaden: Reichert Verlag, 2007), p. 443 text here; F. Harley-McGowan, ‘The Constanza Carnelian and the Development of Crucifixion Iconography in Late Antiquity’ “Gems of Heaven”: Recent Research on Engraved Gemstones in late Antiquity c. AD 200-600 (eds C. Entwistle & N. Adams; London: BMP, 2011), 214-220 (pdf here). This is also discussed in recent works on the cross by B.W. Longenecker (The Cross before Constantine) and J.C. Cook (Crucifixion in the Mediterranean World, 185-186). Alle Veranstaltungen finden in den Räumlichkeiten der Kirchlichen Hochschule Wuppertal/Bethel statt (Hörsaal 4 und 5). 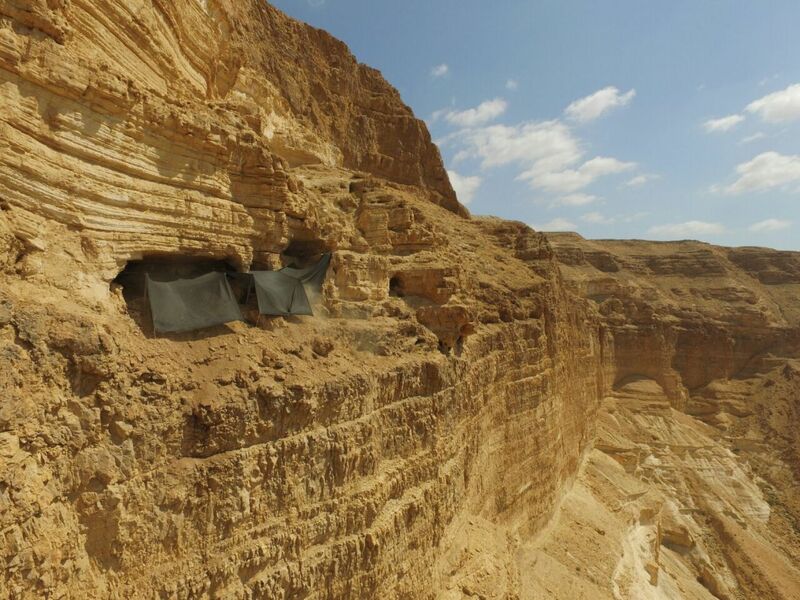 Dead Sea Scroll Forgeries in Your Favorite Bible Software? Good. This is a necessary step in the process. But allow me to make a couple of comments. Second, we have a bit of guilt by association at foot in this list—3 are marked “forgery” the rest are painted with the same pollution brush although marked probable forgery or unprovenanced—but assuming for the sake of argument that they are ALL forgeries, these fragments account for 0.17% of the morphological forms in the biblical data and 0.02% of the non-biblical. Or in other words, 179 of 103,383 and 32 of 174,917 morph forms respectively. Certainly we would hope for 0 elements of “pollution,” but this hardly amounts to the possibility of “major statistical implications” as suggested in the post. I have no doubt that misreadings in the editions is at least as problematic as outright fraud. Finally, my procedure from this point on: my past position has been that I add nothing to the data until I have a peer-reviewed publication in hand. I have had to modify this position as a result of the recent debate: I will for the present allow everything in Tov’s list to remain but I will add nothing of the new publications (not even my own Nehemiah fragment!) until a peer-reviewed debate brings some degree of assurance as to what to remove and what to add. Årstein thinks all the fragments he lists are forgeries adding in the comments that “most of them are just as problematic as the unfamous Gospel of Jesus’ Wife.” He also clarifies that the statistical implications are mostly to do with how many DSS manuscripts we have for various Biblical books. Certainly something to be aware of if you use these modules.